2014 Midterm Election Was The Most Expensive One Yet : It's All Politics The $3.77 billion appeared to come from a smaller cadre of donors than in the 2010 midterms, according to the Center for Responsive Politics. 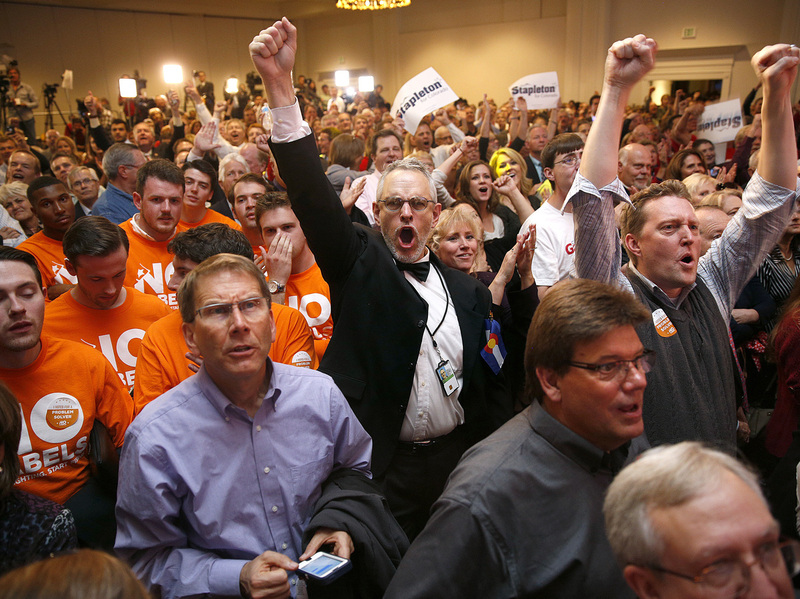 Supporters cheer in Colorado Springs, Colo., as a television broadcast declares that Republicans have taken control of the Senate. Republican candidates, party committees and outside groups spent about $44 million more than Democrats, according to the Center for Responsive Politics. CRP found that the average contribution swelled from $1,800 in 2010, to slightly more than $8,000 in 2014. That appears to reflect the growth of superPACs, political committees created by the Supreme Court's Citizens United ruling and other court decisions earlier in 2010. SuperPACs disclose their donors but have no contribution limits. Another flourishing sector of politics is the 501c4 secret-money groups, which don't disclose their donors or, in many cases, their spending. Conservative groups accounted for 78 percent of the known spending by secret-money groups. (Secret-money groups must disclose some overtly partisan advertising and some field work.) Liberal groups led in the disclosed-money arena of superPACs, with 52 percent of the spending. Overall, CRP found that Republican candidates, party committees and outside groups spent $1.77 billion, about $44 million more than Democrats. Besides the donors to secret-money groups, CRP's data don't include the number of donors who gave $200 or less. Those smallest of small donors are exempt from federal disclosure law.